What does EBITDAR stand for? 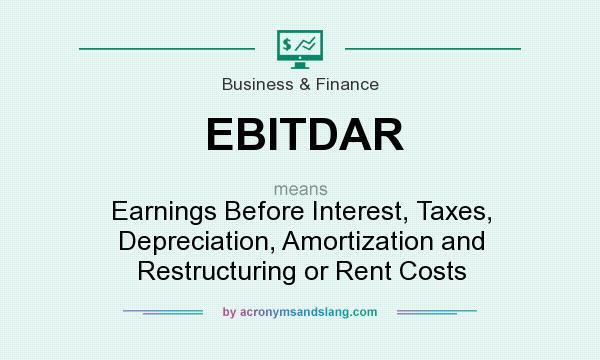 EBITDAR stands for "Earnings Before Interest, Taxes, Depreciation, Amortization and Restructuring or Rent Costs"
How to abbreviate "Earnings Before Interest, Taxes, Depreciation, Amortization and Restructuring or Rent Costs"? What is the meaning of EBITDAR abbreviation? The meaning of EBITDAR abbreviation is "Earnings Before Interest, Taxes, Depreciation, Amortization and Restructuring or Rent Costs"
EBITDAR as abbreviation means "Earnings Before Interest, Taxes, Depreciation, Amortization and Restructuring or Rent Costs"